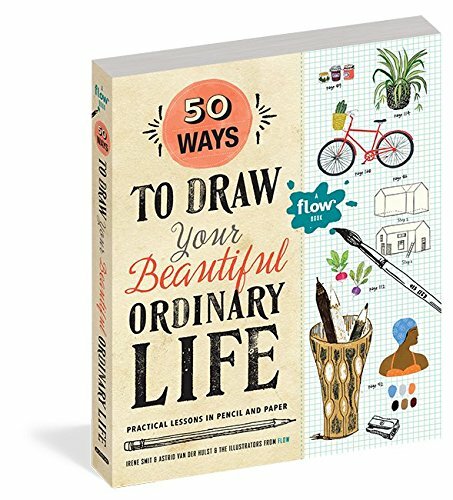 50 Ways to Draw Your Beautiful, Ordinary Life is a special edition book from Flow Magazine, a Dutch art and design magazine about creativity, art and artists. Occasionally, they will release special edition books, such as the one for paper lovers that was featured on the blog before. If you're someone who loves art and craft, who likes to make things with your hands, or who just want to discover your creative self, definitely check out some of Flow's publications. This is a 256-page activity book designed for beginners who want to dabble in art, or who just want a relaxing hobby that you can look back and admire at your own work. The drawing activities revolves around subjects you find in life. The first part of the book gets you to draw things you see at home. There are step by step instructions on how to draw so even if you have no skills, there's nothing to fear. There are plenty of white space left on pages for you to draw on. You can mix your own drawings with the illustrated examples and the result should look pretty good. The second part looks at garden. So you get to draw things that are found in gardens, such as watering cans, flower pots, birds, garden tools and more. Part 3 looks at Style and Part 4 on Nature. Throughout the book, there are also gatefolds, colouring pages, removable postcards and other pretty cool stuff. The dust jacket of the book also has a poster on the back side. There are also numerous blank colour pages included. For exercises that involve using watercolour, watercolour paper is provided — they are bind into the book! This is a cool, fun and creative book. At the time of this review, it's priced under US $20 which I think is a terrific price for a book that can give you limitless fun and creativity. i love these kinds of books but at the same time hate to "ruin" them with my work. ha! I'm sure the book will look better when you draw in it.